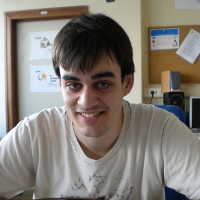 April 2014-September 2014: Internship at GeoSpatiumLab S.L. Business experiment, involving almost everything an e-commerce startup needs, in a small manageable scale. Just having some fun selling something funny. bring corporate world to students. President (September 2007 - present). Púlsar is the Free Sofware Associacion in the University of Zaragoza. Certificate of recognition of distinguished service (November 2012). Co-founder (June 2012 - August 2013). It was born as a business project related to home automation. Involved in CloneWars project and RepRap project. Have some homemade 3D printers (some photos). May The Clone Be With You developer. Hosted it on Amazon Web Services for learning purposes. Co-designed and produced a 3D printer nozzle.